Spain is much more obviously catholic than France. Cathedrals have much more elaborate side chapels, more images, more saints, more ornate generally. Peter went rather protestant, muttering about graven images and asking "How many virgins are there?" as we looked at our lady of this, that and the other. In Toledo we encountered a full religious procession, crowd all frocked up towing a cart holding Our Lady of the Stars, a statue with much gold, white frock and fancy ornamentation. We came upon them doing a 3-point turn to get the cart down the narrow alleyway leading back to its home in a large church. Accompanying them was a brass band which looked more like the local police band or even the salvos than a church band. Their choice of tunes was also more like something from a musical than a mass. They weren't bad, but they got a bit out of time as they went round a corner which coincidentally bore a sign saying "Ancient Instruments of Torture". We wondered, unkindly, if they were modern instruments of torture. Peter's second anti-religious attack occured in Cordoba. This time he threatened to convert to Islam, because he found the mosque stunning, but was distinctly unimpressed by the work of the 15th century catholics who plonked a gothic cathedral in the middle. What really annoyed him was the implication in the free guide that the catholics were merely reclaiming what had originally been a Christian site. Visigoths did indeed build a church there, but according to our guide book, the muslims bought the site from the christians during the Moorish occupation of Spain. 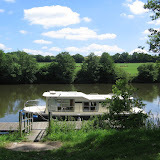 We traversed over 100km of La Mayenne and La Sarthe rivers, upstream and down. I can't retrain my ageing brain to touch type using a French keyboard so a full account of our voyages will have to wait until we return. Suffice to say that travelling in Europe by canal and/or river has been a lifelong dream for both of us, and this trip met all expectations. Our choice of rivers meant that we visited lots of picturesque villages and a few small towns, with internet access therefore hard to come by. Hence the paucity of blog posts while we were afloat. See later posting for more details of where we went. First, Spain is a different colour. France is green and grey, Spain is orange. Terracotta roof tiles, soils red or reddish brown, rosy stone. Clothes: young Spanish seem more fashion conscious than the French, but don´t always dress as well - one sees the occasional clothing disaster, up-to-the-minute fashion that doesn´t suit the wearer. Pink shirts are in for men, windows are full of them and we see quite a few being worn as well. Glasses (ordinary, not sunglasses) are an important fashion accessory for the smart young man. Sideburns are in. No one, male or female, wears hats of any kind, despite the sun. No baseball caps, none of the hats currently in fashion for cool young guys in Melbourne. Only the Japanese tourists in their inverted flowerpot hats have covered heads. Architecture: Juliet balconies everywhere, about a foot deep. Almost every window has one, even in hotel rooms, although the apartment we are renting in Barcelona has, unusually, a very large balcony with table, chairs and a place to hang washing, pegs supplied. As one of our guidebooks says, the Spanish eat to live, not the other way round, and at first we were a bit disappointed by the food. We found one excellent tapas bar in Salamanca, but apart from that we had to wait until Barcelona to find really interesting gourmet food. Barcelona also has more non-smoking restaurants, and caters for vegetarians. Traffic lights: Spanish lights cheep to indicate that the pedestrian light is green. It begins as "cheep...cheep..." then switches to "cheep cheep cheep" when you need to start running. And you really do. Unlike our long periods of flashing and non-flashing red before the lights change, in Spain you barely get time to finish crossing once the light starts to flash. As a result pedestrian behaviour is much better: no one starts crossing unless they are confident that the light has only recently changed to green. Traffic: Despite dire warnings, we didn't find driving in Spain worse than France. French drivers are more likely to observe the speed limits, especially temporary ones for road works, but drivers in both countries are more tolerant of last-minute lane changes than driversin Oz. We note that the favoured marque of the lawless who drive at speeds of 150-200kph on the motorways is a black Audi. By the time you discern the distinctive four rings in the rearview mirror, you have about 2 seconds to move out of the overtaking lane. (With apologies to nephew Nick who wrote a song of the same name). We thought France was civilised because days start and finish late: parking meter restrictions don´t start until 0900 and break for lunch between 1200 and 1400, restaurants don´t start serving until 2000. Spain is even more suited to night owls like us - we can get out of bed at between 0800 and 0900, check our messages and mail and do the odd bit of washing or eat breakfast, start the morning activities as late as 1100 and still have 3 hours of sightseeing or whatever before lunch at 1400. Suits us fine. When dusk falls at about 2100, it´s time to look for somewhere to eat an evening meal, and one might still be sitting in a square with a drink or the last stages of a meal close to midnight. And it´s a game the whole family plays - in Salamanca we were wondering whether we might have left it a bit late to find a restaurant still serving when we sat down at 2200 on our second night in Spain, but within a few minutes an extended family of a dozen people including a pre-teen and child of about two sat down at the next table. We recently made a one night stop at a modern hotel conveniently close to the motorway route from Granada to Barcelona, and again felt uncomfortable when we were the sole occupants of its large restaurant at 2130. By the time we left after a very good fixed price meal, it had a small crowd of other diners, including a family. Back at the parking meters, in Spain they don´t start until 1000, and also take a mid-afternoon break like the French ones do, but of varying length. They must have complex internal programs, as you can still put in money to cover the whole day, including the break, as we did in Toledo. Four nights in Toledo, three days in the wonderful art galleries of Madrid: Monday Reina Sofia, Tuesday Prado, Wednesday Thyssen-Bornemisza. We commuted from Toledo on the fast train, which takes half an hour in an air-conditioned reserved seat and lands you at Atocha station, conveniently close to all three museums. As well as all the wonderful art, the galleries are cool, quiet and smoke-free which was welcome as the temperature was in the mid-30s each day. We didn´t find the heat oppressive unless we were walking in direct sunlight, but by the time we walked back from the station to our Toledo hotel each evening, we were always hot and tired. The hotel was pleasant and quiet with cheap parking on the street and we think it was a good alternative to staying in Madrid proper. When not improving our minds with the huge range of art in Madrid we made the statutory trips to Plaza Major and Plaza del Sol in Madrid, but were unimpressed: the squares were less attractive than those in Vitoria and much less attractive than Salamanca, and the shopping streets didn´t compare with San Sebastian or Vitoria. We did like the gardens of Buen Retiro, where we escaped for a sit down in the shade. We mastered the Metro and used it to visit Cecilia O´Dwyer, Provincial (head) of the Loreto sisters in Spain. She is a friend of our friend Liz Hepburn. We really enjoyed an opportunity to lunch with her and have a serious conversation with someone other than one another. Toledo itself is a complete contrast to Madrid - a mediaeval town still largely contained within the old walls. We walked around getting pleasantly lost in the labyrinth of narrow streets a couple of times, and took the tourist train trip around the perimeter on the other side of the Tajo river which forms a natural boundary on three sides. It is somewhat surprising that cars are still allowed within the walls, but they are and they travel through all but the narrowest streets, somewhat reducing your walking pleasure as you are constantly on guard against a car whizzing up behind you. Mark Twain said "Nothing improves scenery like ham and eggs" which means that Spain´s already spectacular scenery must be particularly fine. Jamon is the national dish and is visible everywhere, huge hams hanging in restaurants, cafes, delicatessens, even the service stations on the autopistas. There are jamonerias which specialise in ham, with dozens hanging from the ceiling. Eggs are not as visible, but just as omnipresent, poached in tapas, fried with steak and/or chips, hardboiled in salads, essential ingredient in omelettes, sauces and the ubiquitous flan (creme caramel). It is surprising how much things change as you cross the Pyrenees from France. France seems rather staid, Spain has the feeling of a country full of youth and energy. There is a huge amount of construction work going on - blocks of high rise flats being built around major towns, and new roads everywhere with crash barriers so new they shine silver in the bright Spanish sunlight. We would cheerfully pay the road tolls on the autopistas just to see the road engineering: roads flung across valleys and bored through mountains take us to Vitoria via San Sebastian, where we stop for lunch. On the downside our breathing is adversely affected by various forms of pollution. We are not sure whether France has stricter emission controls, or whether it is just because we are walking around in much larger cities and parking in under-ventilated underground carparks, or because Spanish drivers drive faster, ignoring speed limits. We are sure that smoking is still a way of life in Spain. In France restaurants are all non-smoking, and we encountered few people smoking in the streets. In Spain there are smokers everywhere, young and old, male and female, and only in Salamanca did we find a restaurant divided into smoking and non-smoking. We have just discovered another clean air haven: smoking is banned in internet cafes. We saw very few of these in France, and couldn´t find one in San Sebastian or Vitoria. Salamanca, being a University town, had a number, and we are now using one in El Barraco, a country town on a N-road on the way to Toledo. We have also found fewer people who speak much English, and my pronunciation of phrases from the phrase book seems to be so bad that people aren´t even sure that I´m speaking Spanish. We´ve managed to get ourselves fed and accommodated through much pointing and miming, but it is improving: we are learning more words and phrases and finding it easier getting the message across, sometimes even at first attempt. Restrictions of language meant for the first few days we ate rather boring food: ham rolls, fish and chips, steak and chips. We were getting desperate for greens and fruit. But we have now discovered the delights of the combinacion (a whole meal on one plate, possibly including a bowl of soup), and of course tapas. Spain is also big on fresh juices, so we are getting our vitamins again. Plan A was to take about 2 days to drive from the Loire to Toledo. Are we there yet? After 5 days, non. First, leaving anywhere early in the morning is not really us, so we only drive for half a day at a time. Second, we need a sea fix after all those lush green inland fields. In La Rochelle we enjoy the tang of salt in the westerly wind blowing in from the Atlantic and the familiar clanking of yacht halyards. We stay in Hotel Ocean in the old port, looking out over rooftops rather than boats as our tiny room is at the back of the fourth floor. In La Rochelle the natives are markedly less friendly to us, probably because we see and hear large numbers of English people in the streets here. Waiters speak English, and correct our attempts at French: a waiter struggles to describe garlic mayonnaise and when I helpfully say aoli with my Aussie accent, he replies aoli. I think I´ve accepted the offer to have some with my moules marinieres, but it doesn´t come, perhaps as punishment for mispronunciation. Peter´s pronunciation is also corrected when he asks about a famous yacht Joshua, sister ship to Northern Light, which unfortunately happens to be off sailing in Gran Bretagne. Despite this we like the town with its mediaeval twin towers guarding the port, and the ancient chain that used to be put between them at night now stretched out as a pedestrian barrier. Eating our croissants by the port in the morning sun is a lovely way to start the day. Off La Rochelle is the Ile de Re, which we explore in the morning before heading south. It has more of a beach holiday feel - terracotta tiles rather than slate roofs, small houses. But it also has cultivated fields including vineyards, and towns with mediaeval fortifications. We lunch at St Martin, looking at but not sampling the sea produce in the markets before eating baguette and cheese perched on the seawall, looking out over the very shallow area to the north of the island which is a centre of French oyster cultivation. We would like to compare French oysters with Australian, but they are expensive in restaurants, and sold unopened in the markets, and we don´t have the tools to deal with that. Our last stop in France is also by the sea in St-Jean-de-Luz, a resort town just south of Biarritz which people haven´t yet resorted too, so is pleasantly free of tourists. It has a real plage with hardy souls swimming and is also a fishing port, giving us another opportunity to enjoy breakfast with a harbour view. Although still clearly French, there is a sense of Spain´s proximity in the architecture and the increasing amount of garlic in the food. There are also lots of Basque influences in the names of streets and hotels, including the Ohartzia, where we stay in a studio type room in a delightful garden at the back of the main building. Today is our last day at the gite, tomorrow we head west to La Rochelle, to find French yachties. From there, south to Spain. We have been très contentes here, enjoying being semi-local when not being tourists. In the last few days we've added Chinon and Fontevraud to our list of tourist trophies. At Chinon there are a few people like us walking through the mediaeval town clutching guide books, but we spend much of our time sitting in the square eating another beautiful meal on a glorious sunny day, surrounded by French-speakers who look like the family taking Mum out on Sunday, or having a meal after shopping at the Sunday market, which was packing up as we arrived. There are small children playing in the fountain, mother rescuing the toy car from the water and drying the tears of the toddler who dropped it in. There is one middle-aged English couple nearby, also with elderly Mum, but they like us are exercising their French and amusing the waiters in the process. On our way back from Fontevraud we decide to try navigating by map alone without the satnavs assisting, take a wrong turn in Tours and as a result see what the outskirts of large industrial city look like. A bit like Dandenong. We also drive to Chateau-Renault one day, a medium, non-tourist, not very prosperous town where for the first time we see lots of flats (not pretty, but not as ugly as most flats at home) and youth with tatts strolling around looking as though they don't have enough to do. We discover Bricomarché, the French equivalent of Bunnings, and make an overdue purchase of safety vest and warning triangle (mandatory for driving in France). We cross the road to the Intermarché supermarket and find the same gear at half the price. Merde. We decide our French isn't up to taking the overpriced stuff back to Bricomarché, just grit our teeth and note the lesson. Intermarché is cheap on everything, and we buy some good fruit there at less than market prices. On our last evening we have dinner in front of the fire downstairs with Veronica and Talulah, enjoying food bought from the Amboise market, the local fromager de chevre and the boulanger in Chateau-Renault, washed down with a sparkling Vouvray and a Chinon red. Earlier at the goat cheese farm I make my halting way through an explanation that this is our last night at the gite and that we are dining with Veronica, and am rewarded with an extra piece of cheese, gratuité. I can just manage "Vous êtes très gentille" in response. We will be quite sorry to leave France, and wonder how we will go in a country where neither of us can manage much more than por favor. Watch this space. Pasted on walls and noticeboards around small towns in rural France are leaflets saying brocante and/or vide grenier with the name of the town and the date. Brocante is a flea market, with professional stall holders. Vide Grenier literally means "empty attic", and is the equivalent of the Aussie garage sale, except that you bring your stuff to a common place - the local soccer ground usually, where both the pros and the amateurs range their stalls. On our first Sunday we are given directions by Veronica on where to go and how to find the markets, and manage to find our way to three, in Pocé-sur-Cisse, Bléré, and St-Martin-le-Beau. Although it is cold, muddy and soggy underfoot after early morning rain, we have a great time poking around in other people's bric-a-brac. During a brief shower we join the rest of the locals at the stall run by whatever the French equivalent of the CWA is, where they sell freshly fried frites and very tasty and equally fresh ham rolls. We enjoy watching a woman dressed in a clown outfit playing a barrel organ, where the tunes are controlled by Jacquard-style punched cardboard which unfolds concertina-like to go through the organ. Even though we are consciously travelling light, we still find opportunities for a bit of retail therapy: two eggcups for the gite to hold the large eggs laid by Veronica's hens, a non-stick lifter, also for the gite, a couple of melamine plates for our picnics, and a very french top for me with a Paris label. In Melbourne I looked in vain for a top I could wear on warm evenings which met my friend Anne's criteria for light travel: "all tops go with all bottoms". The vide grenier top is a bit glamorous and exactly what I had in mind. As with most things at the amateur stalls, it is very cheap - a steal at 2 euro. Vive le vide grenier! Now we are settled into the gite we eat out less, having picnics at lunch time and cooking in the evening. This requires us to go shopping with the locals. We've made numerous trips to the local LeClerc hypermarket. This is a vast store like Woolworths and BigW all rolled into one, selling everything: kitchen equipment, hardware, clothes, wine, standard supermarket groceries, and with extensive poissonerie, boucherie, charcuterie, boulangerie, patisserie and traiteur all built in. At first we found it all rather daunting, but we've now found our way about and are less intimidated at the cash register. At the open air market in Amboise each Friday we buy fresh vegetables, meat, poultry, etc. Stallholders cope with our very primitive French, and on hearing our accents often help us out with English which is better than our French. But everyone is very friendly and helpful. Within walking distance is the very good boulanger in Neuille-le-Lierre, and in the other direction it is a 2km walk to a fromagerie de chevre. We arrive at the farm at about 6pm half expecting it to be closed, but are greeted by the owner and manage to convey our desire to buy some cheese. His wife comes to assist, and when we've made our choices, we realise that he called her because he is in the middle of milking. We go through to watch and meet some of the 65 goats on the farm, and see the mechanical milking in progress. Peter wants to tell them that he milked a goat by hand as a child, and that he thinks goats are nice animals, smart, not like sheep. This is way beyond his French, and a challenge for mine, but I manage to convey most of it except that the French word for sheep takes cover in the dark recesses of my mind and won't come out. I work my way through the rest of the farmyard to define it by exclusion (pas vache, pas cochon, etc) before enlightenment strikes and they say "mouton!" A ten second throw-away line from Peter occupies us for about five minutes, by which time we are on very good terms. Walking in the lovely spring weather is very pleasant, but it isn't something the locals do (any more than people walk down country roads in Australia), so we have to watch out for traffic, just as we do when driving. Colours are changing rapidly - wheat fields are gradually turning silvery-gold, canola is starting to flower, and poppies are creating spots of scarlet. Another non-tourist activity is spending Sunday visiting vides greniers in various local villages, but that warrants a post on its own. The gite is a loft in an old farmhouse being progressively restored by Steven and Veronica Oliver, who are American-French and Canadian-American respectively. They live in about half of the ground floor, with the rest used principally as storage. Attached to the building is an old stable with hayloft above, and it is this that has been transformed into the gite. We climb an external staircase, enter an area which is living, dining and kitchen, with bathroom and bedroom opening off it. It is extremely comfortable and well-equipped, and we also have access to the laundry downstairs, and an outdoor area with tables and chairs, and a barbecue. The property has been excised from an old farm called Le Plessis. There is woodland on one side which also spreads across the front part of the property, a garden on three sides, and a small field at the back. During the day there is a constant sound from birds and crickets - at night the birds give way to frogs. Veronica has a very friendly black labrador cross called Talulah who greets us when we return from an excursion. Beauty, a neighbour's horse, grazes in the back paddock from time to time, and there are two black chooks with real personalities. On the wilder side, a huge crow wakes us each morning by tapping on the window requesting food and this morning we saw a pair of red squirrels playing on the lawn. Veronica is a most helpful hostess, providing us with access to a free international phone service, lending us a laptop, helping us use the laundry, and providing us with fresh eggs and vegetables. We are the more grateful because we have gradually learned that she returned from the USA just before we arrived leaving husband Stephen behind after a family bereavement. So we are trying to return the favour and help her where we can, and as a result are becoming friends and will even be trusted to mind the dog when Veronica goes away for a night this coming weekend. It all helps to make us feel less like tourists. So what are we doing with our days? Most days we do one tourist activity. So far we've visited the cathedral at Meaux, the gardens of Fontainebleu, the manor of Clos Luce where da Vinci spent his last years, and five nearby Loire chateaux, inside and out: Chenonceaux, Blois, Amboise, Chambord, and Loches. We've experienced one Son et Lumiere at Blois, which is my favourite of the chateaux. Blois is really three chateaux in one, plus the Hall of the Etats-General, which is the oldest building, and the only remaining part of an earlier fortress. Despite its grand title, this medieval building is a standard French oblong with high roof, its vaulted timber roof held up by a line of central pillars, all brightly painted in red and blue. At the end of the fifteenth century, Louis XII built an L-shaped wing starting at this old hall and finishing in a chapel. Francois I (the French king who met Henry VIII at the Field of the Cloth of Gold), added a Renaissance wing extending from the Hall to form a third side of the square. So far, so good, three contrasting but reasonably complementary buildings. A century later we have Gaston d'Orleans, a seventeenth century vandal and visionary. He was king Louis XIII's brother. Royal brothers can be at worst a serious threat, at best a royal pain in the posterior, and Gaston was apparently a plotter. Louis gave him Blois to keep him otherwise occupied, and Gaston hired Mansart, architect of Versailles, to build him something similar. His plans involved tearing down all the existing buildings, but fortunately for posterity, he did it progressively, ripping off the end of Francois' wing and demolishing the nave of Louis' chapel to make room for the first U-shaped part of his grand building in classical style. After this had been built it appears that the king thought he was no longer a threat and cut off his funding, so that was as far as he got. It is a splendid building, but its juxtaposition against the cut off end of the Francois wing looks like something from a Peter Corrigan set. The completed square makes for a son et lumiere which we found fascinating, despite the fact that all the son was in French, much of it beyond our powers of translation. You stand in the middle of the courtyard, and the lumiere is projected from all sides using each building first successively and then later in pairs and in total as a backdrop to the various stories. And there are plenty, a good collection of kings and queens, including the very powerful Catherine de' Medicis who was wife to one king, mother to three more, and mother-in law to a fifth. There is also a famous assassination, which was quite chillingly portrayed. Despite being a Saturday there were only a handful of people as it was cold. We wore our thermal undies and enjoyed being able to see everything without having to peer over lots of other heads. Generally none of the tourist sites we've visited have been crowded, and most of the tourists are French, with some Americans, English, and the occasional fellow-Australians. The French clearly use the often extensive grounds of the chateaux as public parks, walking and cycling through them, having picnics. We have also observed that at nearly every chateau we have seen a school group, some primary, some secondary, learning their country's history in the places where main events took place. We wished we had been taught history in this manner when we were at school. Because we bought our HTC Touch Diamonds on eBay (see earlier April post), we have two different satnav systems. Peter has Garmin, I have TomTom. After using them for a while, we have decided that TomTom wins on points, although each has its merits. In particular, Garmin seems superior when one wants to be a pedestrian. We navigate with TomTom mostly, but occasionally have both on. One has a choice of voice, and initially we both selected "Jane", a gentle English female voice, and managed on couple of occasions to contrive the situation where we had both machines operating and the same voice was alternately saying "Turn right", "Turn left". I switched my TomTom over to "Tim" (English male), so that if we have both on, we can tell which one is talking to us. On arrival, Tim/Jane says "You have reached your destination". Often this is just the centre of town, and our actual destination is the first nice-looking restaurant. Once parked, Tim/Jane tries to guide us back to town centre. Once when entering a restaurant through a not very attractive bar, causing us to look questioningly at one another, a loud voice from my handbag suddenly said "Turn around when possible". After that embarrassment we took care to turn off the satnav as we got out of the car. Old fashioned technology in the form of paper maps is still the best for journey planning - it is easier to see a large area in one go (similar to using paper charts for planning on the boat). And it provides a backup if the technology fails, so we purchased the very reasonably priced Michelin atlas covering all France. On the subject of driving, our little Renault Modus diesel is a great success - easy to drive and very economical. We are getting about 1000km from its 50l tank. I drove the first 350 km from Paris to our gite. Peter has done most of the driving since while I navigate, but I drive from time to time to keep my hand in. We're doing pretty well, but there have been been two occasions when I've had to shout stop because Peter hadn't remembered to look left and a car was bearing down upon us, once at a speed that would have been lethal had he kept going. It's all about the food (and wine). We are surrounded by people growing it or making it, cooking, eating, serving it. I doubt that France has a slow food movement, there isn't any other kind (well, they do have Macdonalds). Shops shut at midday, even food shops, and everyone goes to lunch until 1400. Even in the cafe in the LeClerc supermarket complex, food is served with style and care. Hot food is hot, salads are fresh, and you get beautiful fresh bread with every course of every meal. To date our favourite cheap eat is a crepe salee: a slightly thicker crepe made from rye flour and with various savoury fillings. All the ones we've tried have been delicious. So far we've had three meals in local restaurants, at progressively increasing prices. Even though these are small, family run restaurants in tiny villages, they have superb food, served beautifully: elegant glassware and china with plates varying to match the food, proper table linen. Service is friendly and attentive. But no one "explains" the food - you are expected to know what you are eating. At our nearest restaurant, Auberge de la Brenne, we watched with awe as a huge trolley with about 20 different cheeses was wheeled to a neighbouring table, where the lone diner selected the cheeses by name. He then ate them while working his way through a book of sudoku puzzles - fine dining for the French is not a special occasion, just a way of life. The meals start with an aperitif and bouche amusee (tiny nibbles), the entree, main, cheese (optional), dessert, coffee and petits fours. Since we have to drive back to the gite, we are grateful for the very civilised French habit of offering most wine in demi-bouteille - about the right amount for us. Even the half bottles have proper corks, stelvin seals seem to have been rejected by the French. To preserve funds and our waistlines, and because the weather has been more suitable, we have had pique-nique lunches (fresh baguette, ham and/or terrine, fromage) and cooked at the gite in the evenings for the last few days. Even with the limitations of 2 burners, no oven, minimal bench space, I am inspired by being in France to prepare meals with care and serve in style. We puzzle over the small patches of woodland which occur every few kilometres. Many are only 10-20 acres. Our working hypothesis is that they serve multiple functions: assist in draining the surrounding fields, provide erosion-preventing windbreaks, provide firewood (we've seen piles of cut logs in clearings), and provide habitat for wild animals, including deer. We were skeptical when we saw our first roadside sign with a leaping deer, until a young deer did just that right in front of the car (going for deer life as Peter said). Fortunately he was driving and his reactions are good, so we stopped in time. After that we were more cautious, especially at night. So far Peter's vigilance has spared half a dozen deer and three hedgehogs. Despite the abundance of wild life, we've seen no roadkill. Peter suggests that the locals pick it up immediately and eat it. France in spring is astonishingly, vibrantly, dazzling green. The bright green of wheat alternates with darker green of barley, the pale green of rapeseed, the varied greens of the patches of woodland which break up the cultivated fields. The only break from green is where ploughed fields have been sown with potatoes or corn seedlings. Everything is so lush, unsurprising as it rains most days. So far it has been Camelot rain - only after sundown or when we are driving or undercover somewhere - and the rainjackets have only come out once, and not for long. We have had 3 warm to hot days, 3 cool to cold days, and today was the first day of another warm spell: temperature rising to 28 degrees later this week. It is so fertile that you can almost see the grain crops growing. In the week since our arrival wheat fields have taken on a golden tinge, and the rapeseed fields have more and more yellow flecks each day. It is such a contrast to dry old Australia. We are enjoying being somewhere where we can have guilt-free long showers. Somehow the French have managed to add more housing in this part of the country without detracting from the countryside. They achieve this by having small clusters of new houses, whose size and shape copies the traditional farmhouses in the area, built on the edge of a village or at a spot on a backroad where there is already one house. You have to look hard to see whether they are new or old. No big estates, no Macmansions, very little of the highly productive farmland put under asphalt. Villages are grey, with patches of blue and yellow irises. They are small, and don't seem to have a high street with shops. Our nearest village has only a boulanger and a single restaurant. The grey rendering is the same in the bigger towns and cities, but there are more shops, parks, flower gardens providing colour. One man and one woman, actually. We collect our Renault Modus and I drive it round the carpark getting used to LH drive, manual gears and driving on the right. Once I stop flapping at the door handle every time I want to change gear, we drive out and down to the nearest fuel stop. Peter can't get the GPS on his Touch Diamond to find any satellites, so we revert to old technology and buy ourselves a map, which gets us to Meaux. Driving down the main roads turns out to be a breeze compared to navigating the narrow cobbled streets of Meaux. Peter is constantly getting me to move over so I don't sideswipe the wing mirrors of parked cars, and I'm constantly moving right again to avoid oncoming traffic. We decide the best option is to park and walk. Cobbled streets now a delight, as is meeting a group of girls on horseback coming down the street. Meaux feels very French as we pass fromager, charcuterie and shops of elegant clothes. Having had 5 meals in a "day" that has gone on for about 20 hours, we aren't hungry. We are in search of a hotel we glimpsed on the way in, but couldn't find again when driving around. Finally we go into a restaurant, get directions, navigate back to the car and drive to the hotel, book in, have long long long showers and collapse. We wake early and go out to buy croissants and pastries for breakfast so that we can feel properly French. We organise French SIM cards for our phones, view the cathedral and eat a beautiful lunch before heading off Loire-wards via Fontainebleu. Peter's Garmin satnav system found satellites overnight, but we still manage to take a number of wrong turns en route. We finally get up courage to tackle an autoroute, and find it surprisingly easy. Rather than roar along at the speed limit of 130kph, we tuck in behind the 90kph limited trucks, and let the rest go by, occasionally overtaking to get a different truck's backside to look at. We muddle through the toll system, as I thought we put a credit card in at the entry tolling point, rather than taking a ticket out. When we finally get to use a credit card at the Sortie it isn't accepted and we have to pay cash. We arrive at our gite Le Plessis in time to meet Veronica, who is charming and helpfully directs us to a nearby restaurant for dinner. Board QF29 and find ourselves at the front of Economy (+) with the babies (-) who are cute and quiet (+) but then there is the bloke watching the comedy channel with the seriously irritating laugh to compensate (-). No room in lockers so one bag jammed under feet (-) but other bag taken away and jackets hung up (+). Food edible but unmemorable. Seats SO uncomfortable we can't sleep even with masks, earplugs and a sleeping pill apiece. At times in pain from stiff neck. Ordeal ends when we land in Hong Kong, where we enjoy a business class lounge and the opportunity to stretch legs. When the Finnair flight is called we queue with the hoi polloi for a while before realising that there is a separate queue for business class. Greeted by hostess who looks like a cross between Grace Kelly and Ingrid Bergman. Settle into business class cabin with 25 seats only 2/3 full. As we accept our glass of orange juice and hot towel and our coats hung and bags are stowed for us, we are reminded of the good old days when we were each important enough to fly business class in Australia at someone else's expense. Play with the seats, which recline to almost flat and have multiple adjustments in between. Enjoy food - anything cold is excellent, hot food less so, but still good. Finnair has multiple awards for its wine list, so we accept the French champagne pressed on us and served in large glasses, even a second round. No trouble sleeping after that. When we wake we enjoy "Notes on a Scandal" on the entertainment system and it seems like no time before we are at the end of our 10 hour flight and landing in Helsinki. Helsinki to Paris goes similarly quickly. No layback seats, but only one other person in business class, so we can both have window seats and enjoy the view of Denmark, Holland, before we get to cloud-obscured France. Charles de Gaulle looks very scruffy after Helsinki, but the bags arrive very promptly, and we are out of there on a shuttle to pick up the car in no time.